Meal planning for the week? You totally need these sweet potato chickpea burgers! 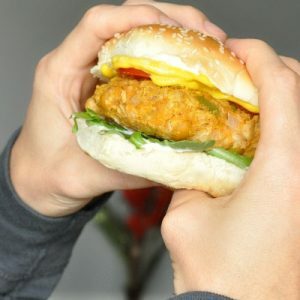 Aside from being healthy, vegan, and gluten-free, these tasty freezer-friendly veggie burgers are just plain delicious! To start, prep your flax eggs by adding 9 tablespoons of water to 3 tablespoons of ground flax seeds. Whisk together and refrigerate for 15-30 minutes to set. Bake or microwave your sweet potato and remove/discard the skin. Set aside. Drain and rinse beans, then add to the sweet potato. Next saute your onion, bell pepper, and jalapenos in approx 2-4 tablespoons of oil with a few cranks of freshly ground black pepper and a sprinkle or two of red pepper flakes. After about 7 minutes or so, add garlic and continue to saute until the veggies are translucent and tender. While they cook, use a large wooden spoon or potato masher to partially mash the beans, but not fully. You can also lightly chop them in a food processor or blender if desired, but the texture from the beans is great so try to keep them chunky. They whole beans give the burgers a meaty texture that makes me feel like I'm eating a traditional burger. Only they're healthier... and more flavorful... and yes, just plain awesome this way. For the oats, they can be left whole or "chopped" by grinding them in a blender or food processor. If you're sneaking them past a picky friend or family member, pulsing is the way to go, if you're pressed for time, toss them in whole! I've had luck both ways! In order to gauge how much of the oats to add, start by adding 1 and 1/2 cups and mix thoroughly. Next take a look at your mixture. It should be a little on the chunky side and slightly sticky. If it feels too wet to form into proper veggie burgers you'll want to add an extra half cup. Good to go? The next step is to form the bean and veggie mix into balls. Cup each ball in your hands and squeeze, pressing it into a compact disc. Think of it as stress-relief! Form into 8 patties, cover, and refrigerate for 30-60 minutes. Feel free to prep these overnight for the following day. Ready to eat? Pour a teeny bit of oil in a skillet, heat to high, and cook for a few minutes on each side until you're left with a golden crust and a warm center. Cook a few at a time, trying not to overcrowd the skillet, it'll be easier this way. Drizzle with yellow mustard and/or sriracha chili sauce and serve on a fluffy bun, wrapped in fresh lettuce, or atop a big bed of veggies. Empty out your crisper and have at it! I typically make one burger right away and then leave the remainder in the fridge overnight. The following day I cook up the rest of the burgers and split the batch between the fridge and freezer. To freeze: simply cook the burgers as indicated above, allow to cool a bit, and then freeze [spaced] on a plate or cookie sheet. Once they've had a chance to partially freeze you can pile them in baggies or your favorite airtight container for fast food without the freaky ingredients.